Ready to read about the science of touch, or haptics, and how it’s a formidable force in building brand awareness and sales success? Our five senses are critical to how we process everything around us. Enhancing a customer’s interaction with a brand or product is all about using human senses to create a more meaningful experience. 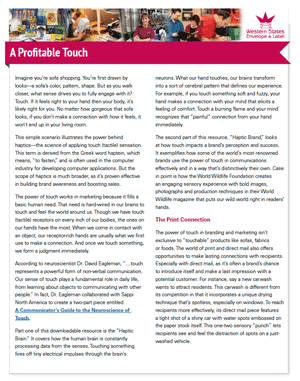 Discover why touchy-feely works to make a profitable difference for you and your customers—download your complimentary white paper below.